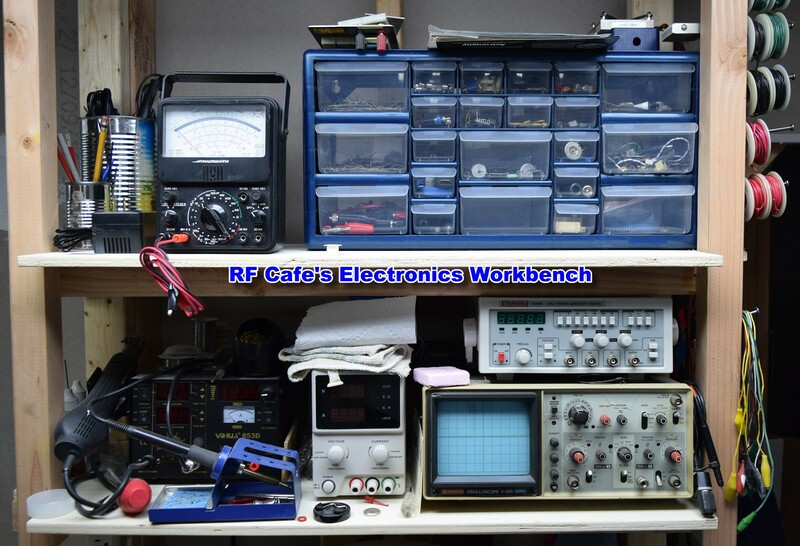 My 1970s-era Radio Shack Microanta model 22-208 FET-VOM with a mirrored scale still does regular duty on my electronics workbench - particularly when the DMM happens to have been left somewhere else. One of the first things a person is taught about using analog meters is to always select a range that put the needle toward the upper end of the scale. It has to do with the accuracy of the reading based on characteristics of the meter movement. A digital meters' accuracy is often assumed to be ±1 rightmost displayed digit, but if you read the specifications, it is often not the case. Shop-owner Mac informs his technician, Barney, on many aspects of issues to be aware of when using both analog and digital meters. 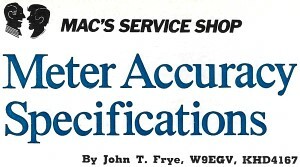 Digital meters would never have entered into the discussion on the earliest stories of "Mac's Radio Service Shop" since they were published when the only digital displays used Nixie tubes and were too expensive for most users. Barney, a little late for work this sunny April morning, had his hands cupped tightly together as he shouldered his way through the front door of the service shop. "Guess!" he commanded Matilda, the office girl, as he stopped in front of her desk. "Knowing you," she retorted, shrinking back in her chair, "it's probably a mouse." Gently Barney took away one hand and held out the other, with a beautiful gold-flecked purple crocus nestling in the palm. "Barney, how gorgeous!" she exclaimed. "Let me get a glass of water." "Thought you might like it," Barney said gruffly as he tenderly deposited the little flower on the surface of the water. "Where's the boss?" "Back in the service department," Matilda answered absently, still spellbound by the sight of the velvety petals floating in the glass. Mac was sitting cross-legged on the service bench reading several stapled-together mimeographed sheets. "Hi, my ten-o'clock-scholar," he said, glancing up. "Have a hard night?" "Nope, just spring fever," Barney answered and then went on rapidly, "but let's not talk about me; let's talk about you. What are you reading?" "A paper sent me by a young friend attending the British Columbia Vocational School in Burnaby, B.C. It's a study prepared by H.F.R. Adams, the Chief Electronics Instructor for the school, and it's entitled 'The Meaning of Accuracy Descriptions of Measuring Instruments.' My young friend says the instructor's lectures remind him of me, which I consider very flattering, considering the impressive credentials possessed by this man." "Anything in there I should know?" Pointer-Type Meters. "Yes, so let's review it. Mr. Adams points out that pointer-type meter accuracies quoted by manufacturers reflect several sources of error inherent in the instrument as part of its manufacturing and calibration process: the balance, alignment, and resistance of the moving coil; friction in bearings or taut-band suspension; shunt and multiplier resistance values; magnetic strength, shunting, and shielding; and the effect of temperature on all of these. In addition, the technician often introduces additional errors because of parallax, pointer width, scale misreading, and improper interpolation of subdivisions of the scale. "Manufacturers have different ways of describing the accuracy of their products. One may advertise '±1% of Full Scale' while another may claim '±1% of Reading.' 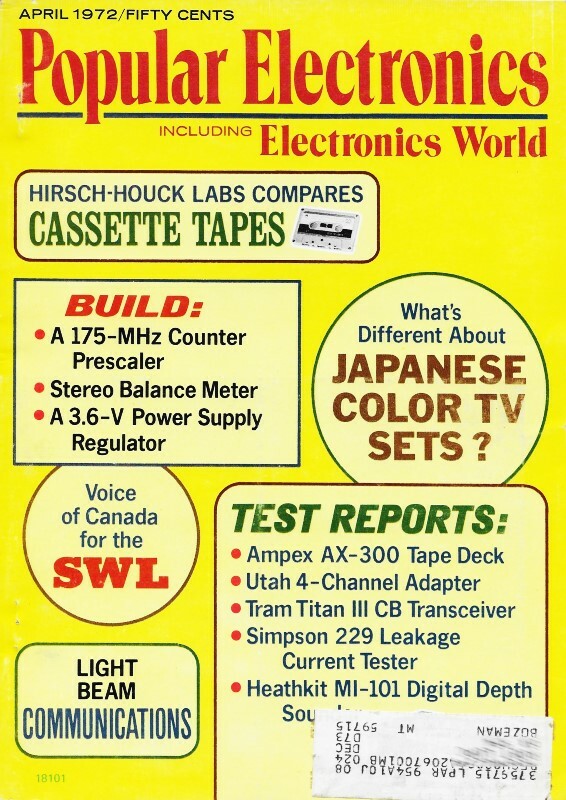 Suppose we compare these descriptions for a voltmeter with a full-scale reading of 100 volts. Obviously the permissible error of the meter with a claimed accuracy of ±1% of full scale will be 1 volt over the entire scale. At the top of the scale, the percentage of error will be 1/100 or 1%. At the 50-volt mid-scale point, this changes to 1/50 or 2% of the reading. At 33 1/3 volts it becomes 1/33.3 or 3% of the reading, and at the bottom of the scale, at 1 volt, the possible error can be 1/1 or 100% of the reading." "A guy would be wise to stay away from the bottom end of the scale on that meter when accuracy is important," Barney observed. "Right. If the reading falls in the upper two-thirds of the scale on such a meter, you can depend on the reading to be off no more than 3% of the true value. That's why a multimeter with many scales affords better accuracy than does one with only a few scales. With the former, you can always select a scale so the reading will fall in the upper two-thirds of the scale." "How about meters in which the accuracy is rated as ±1% of the reading?" "Here the maximum percentage of reading error is constant clear across the scale, but the permissible voltage error increases with the reading to reach a maximum at full scale. In our example, this would be 1 volt at 100 volts. It would only by 0.5 volt at 50 volts and 0.1 volt at 10 volts. This might mislead you into thinking the meter was more accurate at lower readings, but of course the permissible error, 'percentagewise,' is exactly the same at 1 volt or 100 volts. But note the maximum percentage of reading error can never exceed 1% and the maximum voltage error, in our example, can never be more than 1 volt. At full scale, the anticipated accuracy of both meters would be the same; but the reliability of the readings on the meter rated at ±1% of full scale would decrease as the pointer moved down-scale, while the percentage-of-reading accuracy of the other would stay the same." "Some manufacturers have done their best to decrease 'cockpit trouble,' or operator error," Barney pointed out. "A mirror beneath the pointer lets the operator avoid parallax errors by moving his head until the pointer is directly over its reflection before taking a reading. Some multimeters shift a different appropriate scale into position with each setting of the range knob, or they illuminate the proper scale. But how about the new digital voltmeters? Does Mr. Adams say anything about those?" Digital Voltmeters. "Yes, and I have a few thoughts of my own to add. He points out that DVM's eliminate reading errors. Viewing angle does not affect accuracy of readings; and, in most models, placement of the decimal (selection of the most sensitive range) and indication of the proper polarity are all automatic. However, DVM's do have other internal sources of error. Noise riding on the voltage being measured must be filtered out to avoid errors with high speed DVM's. Amplifier zero drift and offset voltages arising from switch positions can contribute to error according to Mr. Adams. Finally, a DVM has a built-in ambiguity error of ±1 digit. "To understand why, you must realize that, in a DVM, the measured voltage is balanced by an internal voltage in a bridge circuit. The internal voltage is applied lightning-fast in counted and displayed identical increments until the bridge is balanced as nearly as possible. By that I mean we reach a point where the bridge is almost nulled on the low side; yet the addition of one more increment of voltage makes it just slightly unbalanced on the high side. The displayed count can stop on either side of the true null, with the unbalance not being sufficient to cause the addition and subtraction of another unit of voltage and consequent change in the right-hand, least significant digit of the displayed voltage. "DVM's usually specify accuracy as a percent of reading plus a percent of full scale. Sometimes the latter half is given as a number of digits. A 5-digit DVM accuracy may be specified as either ± (0.005% of reading plus 0.001% F. S.) or ± (0.005% of reading plus 1 digit.) Both are the same. As in the case of the pointer type meter, the percent of reading error is fixed, but as the reading increases, the number of digits error increases. On the other hand, the percent of full scale determines the greater portion of the permissible error on the lower portion of the scale. This can be an important factor in selecting a DVM for a particular purpose. For example, a DVM with a specified accuracy of ± (0.01% of reading plus 1 digit) will be more accurate over the lower 80% of the range than will one with a claimed accuracy of ± (0.005% of reading plus 0.005% F. S.)"
"I guess the accuracy of a DVM depends on the number of digits displayed. Is that right?" "Probably it's better to say the 'resolution' of a DVM depends on the number of digits. Resolution is the amount of change in the voltage being read required to produce a 1-digit change in the reading. As the number of digits in the display goes up, the value of this voltage goes down. You might lump all these factors together and say that, in general, if you need 0.01% accuracy over most of the range, it's advisable to buy a 5-digit DVM; if 0.1% accuracy is sufficient, a 4-digit instrument will do; but only if 1% accuracy over most of the range is good enough should you buy a 3-digit DVM. However, if your needs are centered around a particular voltage, computing the accuracy at or near that voltage, according to published specs, is the best way to select an instrument. If this voltage falls near the full scale reading of any range, you can expect 0.1% accuracy and resolution from a 3-digit DVM, 0.01% accuracy and resolution from a 4-digit, and 0.003% accuracy and 0.001% resolution from a 5-digit instrument." "DVM's have better accuracy and sensitivity than pointer-type meters, don't they?" "Yes, because they lack the mechanical friction and inertia of moving coil meters, they can respond more quickly and to much smaller changes in voltage than can pointer-type meters. While DVM's are not designed to perform as laboratory standards or to replace laboratory potentiometers, they have brought near-laboratory accuracy into the field and into the production line." "Do you think radio and TV service technicians should use DVM's in their work?" "If you mean do I think we should replace our pointer-type meters with DVM's the answer is no. We do not need anywhere near the accuracy of even a 3-digit DVM. Rememberr most resistors in radio and TV sets have a 10% tolerance and most voltages listed on schematics are within ±20%. Using a DVM to perform routine voltage checks in our work would be about as logical as mounting a high-powered telescope sight on a shotgun. However, I'm thinking of buying at least a 4-digit DVM for use as a reference in checking and calibrating our other meters and for use in those few cases where critical voltage measurement is necessary. I have a hunch the quick response of the DVM might also be useful in some intermittent cases." "I guess no matter what instrument a fellow uses, he ought to know what to expect from it," Barney observed. "That's right. When you are using any tool, you cannot use it to the fullest extent and with confidence unless you know two things: what it is capable of doing, and what its limitations are. The latter is just as important as the former, for it avoids trying to do something of which the tool is incapable. Then you know the accuracy limitations of a meter, you keep these in mind when taking a reading; furthermore, when the accuracy is not uniform across the scale, you are in a position to take advantage of this fact in selecting the range that provides maximum accuracy."